Learn about Big Sur, California by reading Big Sur—Big Scenes by Charlie Spence, Travel Writer. It features a mini, but thorough tour of the destination, plus all you'll need to know to plan your trip including getting there, objective information on places to stay and eat, and things to do. At the end of the article, we've provided a summary of the contact information for your easy reference. Enjoy! As you travel down California Highway 1 through Big Sur you will quickly see why this route is designated an American National Scenic Byway and a California Scenic Highway. These honors are reserved for highways so distinctive that they are destinations in themselves, but it is just your introduction to a vacation crammed with viewing unique and breath-taking beauty, restful hours to take in the rugged redwood groves, or pampering yourself at one of the award-winning lodges or resorts. Just south of Monterey in northern California, Big Sur has one of the most spectacular coastlines in the world, and you can explore it from a base of one of the luxury hotels with spas, a modest-priced lodge, or a rugged camp site. Wherever you may wander in the Big Sur area—coastline or interior parks—you will find something of interest. You will find it a treasure exploring the unspoiled national parks, the gift shops, and the unusual array of different attractions. Start with the beaches. They are not what you think of as long, sandy stretches of sunny shore like found in southern California. Those in the Big Sur area may be difficult to find but are well worth the effort. Much of the beach area is on private property but several state park and U.S. Forest Service beaches are open to the public. Breath-taking beauty awaits you at these. Even during the summer months the climate is seasonably cool at the beaches as fog often hugs the coastline, so you might not want to venture much into the water. But, as you hike to the scenic spots be sure to wear comfortable shoes to make the short trek in comfort. You can watch the sea otters at various locations throughout the Big Sur. This animal came close to extinction, wiped out by fur traders, until they came under protection of the Endangered Species Act. A small group of otters was found along the Big Sur coast and, under protection, increased to where there are more than 2,000 today. One of the first places you will want to visit is the historic Point Sur Light Station. This historic lighthouse sits 361 feet above the surf on the seaward brow of a large block of volcanic rock. Prior to its construction, the area was the site of several disastrous shipwrecks. Built in 1887-89, it is now the only intact light station along the California coast open to the public. Even during the summer months weather around the area is generally cool so have some warm clothing. 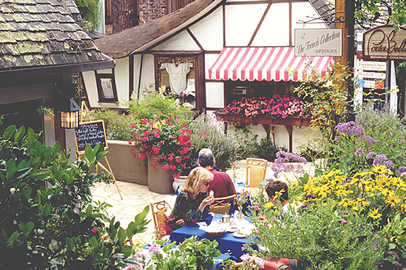 Outdoor cafes and unique architecture are common throughout Carmel-by-the-Sea. By all means take a visit to Carmel. Here you will see some of the most beautiful scenery to be found on the west coast. And, you just might see a few prominent people as many find this an ideal location for living. Actor Clint Eastwood is the honorable Mayor. You will find boutiques, fine restaurants, art galleries and fabulous shopping. Farther south you will visit Andrew Molera State Park. About 23 miles from Carmel, this is the largest state park on the Big Sur coast. Its mile-long winding path to the sandy shore is sheltered from the wind by a large bluff to the north. You will find the path almost as interesting as the sight at the beach. The meadow is filled with wild flowers and sycamore trees. The most popular coastal access point is the U.S. Forest Service’s Pfeiffer Beach. However, it is difficult to find for those who have never visited. Even with directions from the locals, your first time going will seem improper because you will be going over an unpaved, ungated road off Highway 1 between the post office and Pfeiffer Big Sur State Park. But once you travel the two miles to the end you will be at the end of the road where there is a large parking lot and a path leading to the spectacular beach with a remarkable stretch of sand. Just off shore a large rock formation offers views of dazzling sunsets. Hikers will find a scenic trip along Pfeiffer Big Sur Creek through one of the finest redwood groves. At the end there is the spectacular 60-foot high waterfall. The roundtrip hike is only 1.4 miles. This might read like someone who is in love with the Big Sur. That’s only because it is true. The San Francisco area was my home for ten years and the Big Sur was a destination for unique adventure and beauty. Outdoor beauty is but one of the attractions of the Big Sur. It is a well-known art center where galleries and gift shops offer a blend of discovering a variety of handcrafted items and shopping for just the item you have been looking for to place in that bare spot in the living room. Of course, if you prefer, use your time to do one of the projects the area is noted for—nothing. Relax, soak in the beauty, and head back home refreshed and rejuvenated. 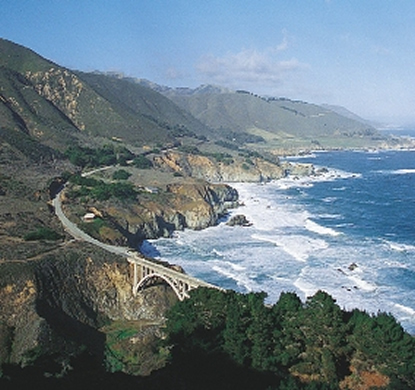 The quickest way to get to the Big Sur area is by air to the Monterey Airport. Four airlines offer direct service via international and domestic routes. These airlines have direct flights from San Francisco, Denver, Las Vegas, Phoenix, San Diego, and Los Angeles. Amtrak’s Coast Starlight train comes thru Salinas once a day on its trip between Seattle and Los Angeles. It is about a half-hour bus ride from Salinas. Greyhound bus is another method of arrival. For the motorist, two main highways offer magnificent views of the Pacific Coast. These are Highways 1 and 101. These are just four of the fine places. Make your choice and reservations through WTA’s Online Travel Booking Service to get the best deal and the kind of facility that best suits your needs. The area is noted for fine food and fine service. Notice: This information is current as of April 2010. It is recommended that you contact the numbers, and/or visit the websites above to determine any changes to the information.